The Ford Mustang boasts a pretty prestigious title. It is the most iconic sports car in America, with millions of fans all over the US and world. The new 2018 Ford Mustang enters the sports car arena ready to fight with more power and technology than ever before. 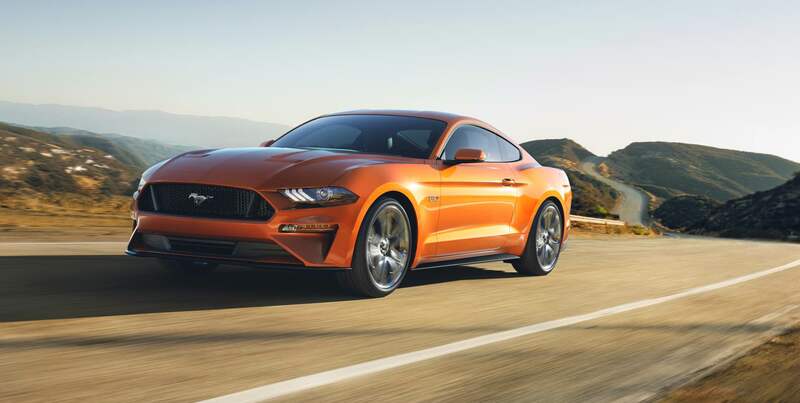 New for 2018, the Mustang has direct fuel injection added to its V8 engine, an available 10-speed automatic transmission that offers higher average power for acceleration, and a redesigned manual transmission that increases torque. Drivers will also get to experience Ford's first all-digital 12-inch LCD screen in the dashboard. The instrument cluster is customizable and has three distinct view settings. As for the body, the 2018 Mustang displays a burly stance with its new lower hood design with vents and a new rear and front fascia. There is so much more to say about the new 2018 Ford Mustang, so keep reading to learn more about this exciting sports coupe! The new 2018 Ford Mustang offers its 2.3-liter EcoBoost four-cylinder engine as standard. The engine is calibrated with Ford's transient overboost technology which increases the torque output of the engine. The larger engine option is Ford's renowned 5.8-liter V8 engine, which has been redesigned with new direct fuel injection along with its existing port fuel injection to increase horsepower and torque. A six-speed manual transmission and a new ten-speed automatic transmission can be paired with either engine. The new automatic transmission is the best that Ford has ever offered in a Mustang, with its quick shift times and different drive modes. Drivers will be able to use the steering wheel-mounted shift paddles to take more control of their driving experience. Handling on the 2018 Mustang has also been tuned to create a more responsive and controlled ride. New shock absorbers, an updated rear suspension and refined stabilizer bars have all been added to the vehicle. And for the true muscle-car lover, the rumble of the engine can be adjusted to his/her preference with the available active valve exhaust system. Drivers can create a loud metallic snarl or a soft steady rumble, all easily controllable with the new exhaust system. 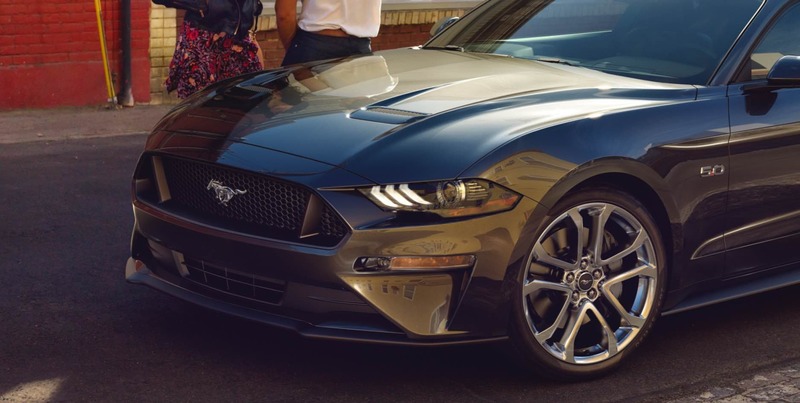 The design of the 2018 Ford Mustang captures the style of the heritage Mustang while also blending it with modern, aerodynamic lines, creating a commanding, stylish sports car. Ford knows that this car deserves to be customized, so they are offering twelve new alloy wheel choices and three new paint colors for the 2018 model. As mentioned earlier, the digital instrument cluster is also customizable with an array of colors and layouts. Unique technology like MyMode and Ford Sync Connect with FordPass is available in the 2018 Mustang. MyMode is a memory function that stores your driving settings for the next time you drive, including suspension and steering preferences, while Sync Connect allows you to remotely unlock and start your vehicle or check your fuel level from the convenience of your smartphone. 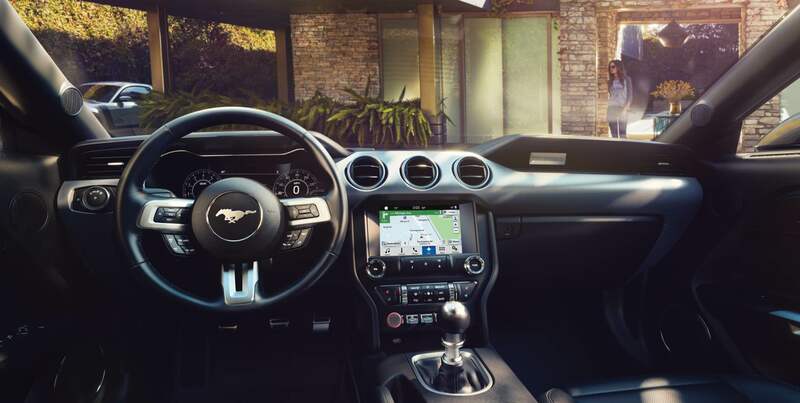 For the interior of the 2018 Mustang, new detailing highlights the Mustang's quality, such as a hand-stitched wrap on the center console and aluminum accents on the handles, knobs and steering wheel. There are also new patterns and color options for the interior upholstery, and of course, the signature Mustang badge can be found on the steering wheel. Ford has refined its cabin making it stylish, modern and comfortable. We can help you estimate your trade-in value! Click here to go to our form to value your trade-in. Where can I schedule service? You can schedule a service appointment by clicking here! When will the 2018 Ford Mustang be available at your dealership? The 2018 Ford Mustang is due to be released in the fall of 2017. Click here to go to our contact form so we can tell you when it arrives! Contact us here! New for 2018, Ford has rolled out numerous advanced safety features in its Mustang. For example, pre-collision assist with pedestrian detection, distance alert, lane-departure warning, lane-keeping assist and a driver alert system are all available, in addition to its standard safety features carried over from its previous model. Ford hopes to delight all its existing Mustang fans and earn new fans with this new release. We would love to give you more information about the 2018 Mustang and contact you when it becomes available at our dealership. Fill out the form below, call us, or come on in so that we can stay in touch with you!